Now that construction is underway on Phase I of The District at Deerfield, the $140M urban-style, pedestrian-friendly, mixed-use development is garnering national attention. Located in Deerfield Township, the site is surrounded by the affluent suburbs of northeastern Cincinnati. Phase I includes a 242-unit apartment property known as One Deerfield and a medical office complex to be occupied by regional powerhouse, Mercy Health. The District at Deerfield will also feature 95,000 square feet of retail and restaurant space along with a proposed hotel in a fully integrated and walkable “town square” design. The District at Deerfield is surrounded by one of Greater Cincinnati’s dominant regional retail markets, not to mention one of the region’s top suburban office markets. The households in a 5-mile radius of The District at Deerfield boast average incomes over $110,000. 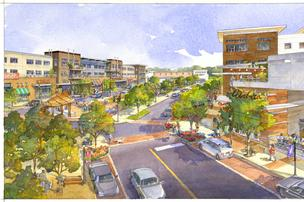 OnSite Retail Group is handling the retail leasing for The District at Deerfield. For information, please contact Josh Rothstein at (513) 268-4453 or Jeff Smith at (513) 924-5262.